Janak’s Movie Recco: Ram Ke Naam (In The Name Of God) | Mehta Kya Kehta? In December 1992, Hindu extremists, members & followers of VHP, BJP & Bajrang Dal, karsevaks, were allowed to take over Babri Masjid. We all are aware to some extent about the events that took place post that. Ram Ke Naam, a documentary feature, shows the events & atmosphere of 1991, in which the masses were incited to march towards the mosque. A rath yatra, led by L.K.Advani under the flag of the BJP party, lies at the crux of the documentary’s narration. From the start it is made evident that this was a political rally and never a rally to get back Ram his birthplace and appease the desire of the Hindus of India. It was all about misleading the public & accumulating the Hindu vote & the Hindu funding. And, they succeeded. The Hindus who had nothing to do with Ayodhya & the Babri Masjid were now wanting to prove their identity. 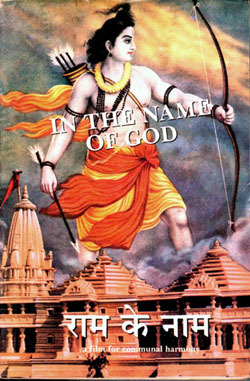 With already so many existing temples in Ayodhya and no historical record at the shelter in which Ram was born; their “divine knowledge” helped them determine the exact spot of Ram’s birth, which happened to be at the spot of an existing mosque. The documentary interviews people from different Hindu classes, Muslims; and gives you insight into what the people had to say about the building of the temple. The people living in smaller towns & rural areas, which were shared by Hindus & Muslims alike, through their views, give a sense of calm that existed, and of the fear & riots they were expecting to take place after. But, the places which had Hindu majorities show you their completely different expectations & demands. And for the karsevaks, you will be able to clearly see how misled they were, to put on saffron headbands and think they were going to achieve some sort of glory. Pujari Laldas, the High Court appointed priest for the Ramjanambhoomi Temple, candidly talks about the intentions of VHP, BJP and the other Hindu priests. In the madness that surrounds him at ground zero; he maintains his soft tone and very peacefully shares his anguish & hurt for the people, who will have to face the consequences from the plans & actions of the powerful & rich Hindus. Laldas questions what he sees not only around him but also the events taking place throughout the country, and then compares it to the teachings of Hinduism. It is rare to find people who take a position & stand by it. The documentary is made by Anand Patwardhan, who considering the diversity & complexity of the Indian society, has delivered a work which is complete, with no loose or open ends. The work includes people from different religions, castes, law departments & economic classes. Anand‘s tone in his interviews is very noticeable, which remains calm & composed even while confronting karsevaks who talk about demolition & murder. This work is two decades old, but it will remain timeless and always reflect on us. Why do we shy away form the fact that we are a Hindu majority country? This secularism nonsense has go on too long. In no country in the world, do minority communities enjoy the kind of freedoms they do in India. Thanks for leaving a comment. But, how is it related to Babri Masjid & Ramjanambhoomi? It is related the Allahabad High Court’s verdict regarding the Ram Janmabhoomi and the 1/3 share granted to the Waqf Board. They got their share because they have rights in this country and that comes from the secular nature of our civil society. In countries where religious minorities do not enjoy the kind of freedoms they do here, I doubt whether they would even get a court hearing, let alone their ‘share’. Further to my explanation, when I say minorities enjoy a lot of freedom in this country I refer to the fact they they are allowed to practice their own law, when actually, the State should have worked to create a uniform civil code as stated in the Constitution. Hindus have over centuries been very docile about the abuse of their religious sentiments (eg. killing of cows). Today when Hindus get together to fight for their religious rights, it is often termed ‘religious extremism’ or ‘Hindu extremism’. There is bound to be political fallout in such matters because in a democracy, politics dictates State affairs. This is the biggest flaw in a democratic system of government. 1. A lot of Indian historians say that there is no proof of a Ram temple being at the place of Babri Masjid. This fact was manufactured by the British to help their divide & rule policy. And, we fell in the trap back then and now new traps are being created by our leaders. 2. One aspect this documentary covers and as I have mentioned, “With already so many existing temples in Ayodhya”; why do you need another temple? How many people do you know who have been to Ayodhya to visit the temples currently there and how many would visit if a new temple was built? The people of Ayodhya have to decide whether they want another temple or not. Not you, me or Advani. Not all Hindus were asking for this temple. My parents & I were not one of them and Advani cannot say in public that this is a demand of all Hindus. 3. Agreed that the Sharia law operates in India in certain parts. But, the problem is that the political parties do not intervene or allow the law enforcement bodies to do their jobs because it treats people as vote banks. As simple as that. And lets be clear, not all Hindus obey the constitution. So why are you complaining? Just because they are following another law, which is different from the one you ‘do not follow’, but think you follow; does not permit you to point your finger at them. But, again that’s mass attitude of being in the majority. 4. Cows being butchered for food? Don’t you see other animals being slaughtered as part of the food industry? I know Brahmins who enjoy eating fish, mutton and chicken, but when it comes to cow meat…”oh no, thats holy”. Also, have you seen the garbage and loads of plastic that cows in the city consume? The people who get all that plastic out are just people doing their job, and definitely not people like you. 5. Of course there is Hindu extremism in our society. The caste system that has existed for centuries is an extreme & ugliest form of system used to maintain the structure of society. The people who were pushing for the Ramjanambhoomi were Brahmins again. Again, they had no regard for human life and just their place in society to retain power & money. Like in certain Islamic countries women are forced to follow a certain dress code, Hindu parties are coming out in the open in some of cities telling the people – ‘shut up and obey what we preach, because what you do is wrong as per Hinduism’. The saffron & green brigades are no different from each other. 6. It is always important that people in the majority understand its potency of being in the majority. The majority is not a majority of intellectuals. They are a mass of people who can be easily persuaded to even behave as animals, easily forgetting their docility. The real minority constitute the people who see other people just as people, nothing more or nothing else. I hardly meet any of them. The majority consumed them or drove them away. I’ll suggest you now go and see Ram ke Naam.